After the warmest year on record in France, a cold front has moved in. My apartment relies on individual electric heat – piddly little units to warm each room. Penny pincher that I am, I rotate: turning the one on in the living room where I work during the day; switching on the one in my room at night. That leaves the hallway, kitchen, and bathroom to glacial conditions. This does little to motivate me to start cooking more, though it’s perpetually on my to-do list. And going to the bathroom feels like a courageous expedition. Seriously, I don’t think ice in the toilet bowl would surprise me. (These rooms, of course, do have their own little heating units. The one winter I treated myself to a toasty apartment, my astronomic electric bill made my blood run cold in my warm body so I reverted back to piecemeal heating and bulky sweaters). 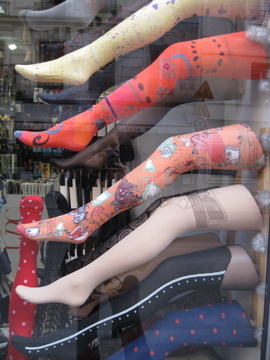 If it’s going to be cold, might as well wear funky tights. Still, I’m not minding this winter so much. The sun shines much more frequently than I ever remember. This is the season that habitually conjures the dreaded grisaille (unending gray skies), yet here we are often with sun! I like the artificial light lamp I gifted myself for my birthday, but honestly, there’s been enough of the natural stuff that I’m not certain I needed it. I headed out the door soon after to catch the last light of the day; some stunning pink played across the baby blue sky. When I arrived at the butcher’s 15 minutes later, there was already a small line. But I was asked immediately what I needed. For the past six and a half years, I’ve lived on the border of the 11th and the 20th arrondissements. 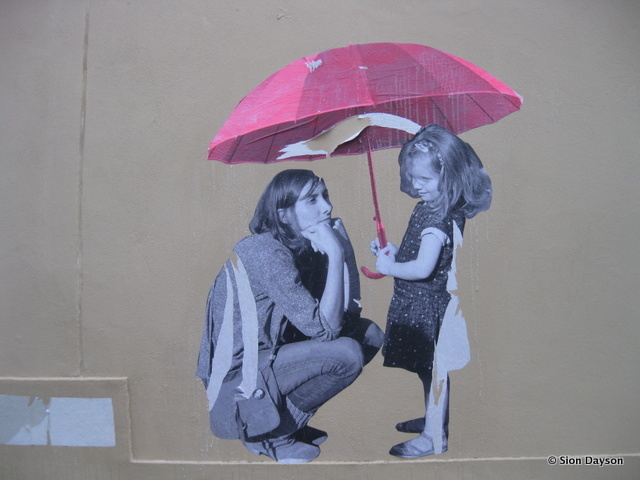 I’ve long known that these 2 districts have the highest concentration of street art in Paris. But my specific neighborhood isn’t the hot center for seeking out these ephemeral works. For that, I need only hop on the metro a few stops. 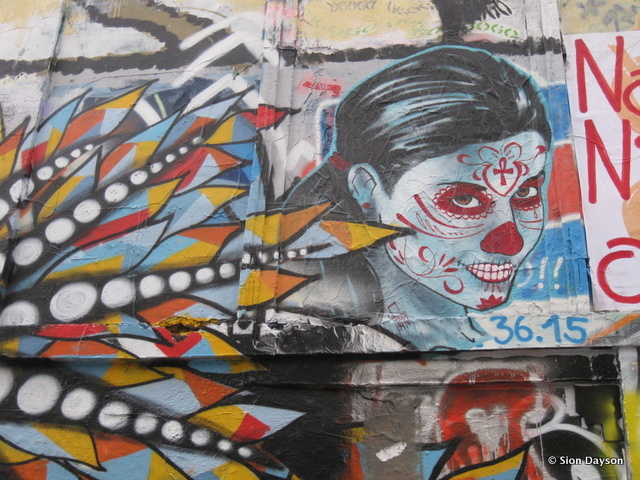 Yesterday, I did just that to join a street art tour. 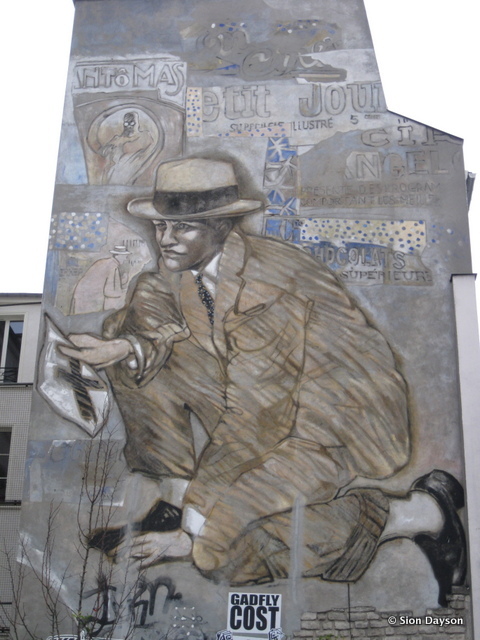 Led by photographer and poet Richard Beban (and husband of my new writer friend Kaaren Kitchell; the pair produce the blog Paris Play), the tour began on rue Oberkampf. 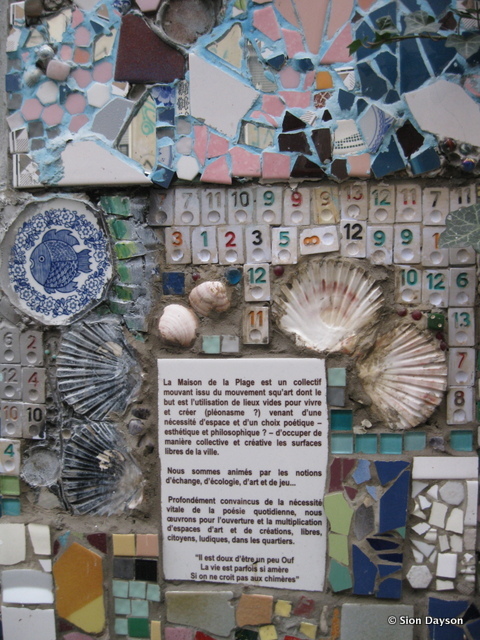 La Maison de la Plage is an arts collective on Paris’ most famous free zone for street art, Rue Denoyez. A cold December day, we spent a little too long at the outset standing in one place. It was easy to understand why, though. Richard is a font of knowledge and provided an excellent historical overview of why this particular area birthed the street art movement, backed by rich Paris history. Once we got moving, we covered a lot of ground. Some works I’d seen before, but a great many were new to me. Of course, the very nature of street art means the landscape constantly changes. Weather, the elements, other people or the city itself covering up the works are just a few reasons works disappear from view. 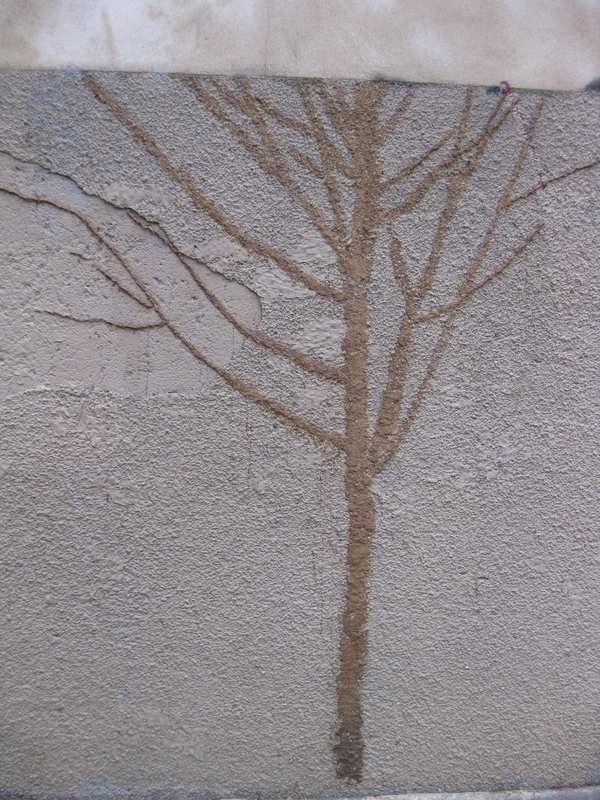 (A landlord can ask the city to paint over anything from ground level up to 3 meters high. Anything higher is at the landlord’s expense to cover. A reason many artists aim above the 3 meter mark). 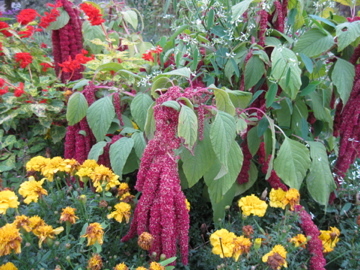 What a great boon to have an expert guide for mapping a lively itinerary and offering valuable background information. I learned so much about the different artists and the context, including political roots. And we were led to some incredible surprises! As photographers, tourists and anyone else wanting to see the Iron Lady in all her glory know, Trocadero offers Paris’ best viewing spot of the Eiffel Tower. Trocadero is also site of the Palais de Chaillot where in December 1948, the Universal Declaration of Human Rights was signed by the United Nations. This confluence of the scenic and the symbolic serves as a compelling assembly point for many gatherings. 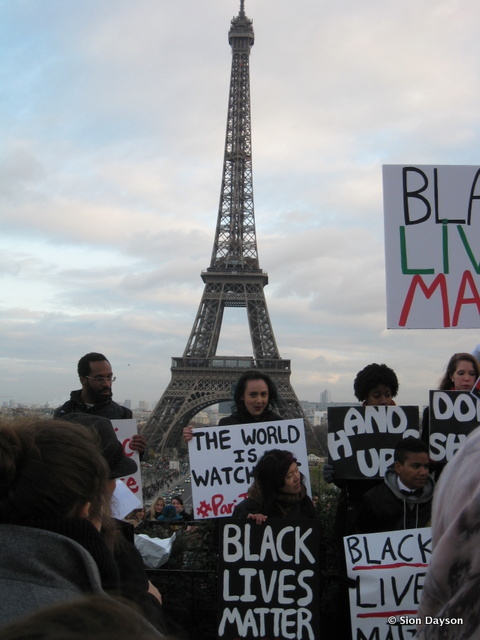 On Saturday I learned at the last minute about a peaceful protest called Paris to Ferguson organized to show solidarity with those speaking out against police brutality. I hesitated for just a second – my thoughts, my heart, have been tuned to the events happening in the United States. Does it matter to hold signs and raise voices here in the City of Light? 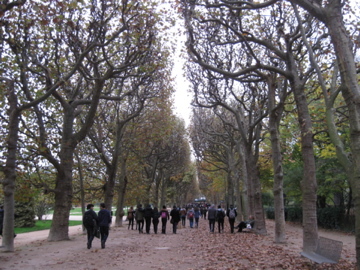 A recent fall walk through the Jardin des Plantes. Since living in France, Thanksgiving has always been an improvised affair. Some years I’ve gathered in the apartments of friends who are much braver than me – they hunt down the obscure cranberry, shove large turkeys into tiny Parisian ovens, spend small fortunes on the fixins’, many of which are foreign foods here. I’ve been to lively potluck parties and more intimate dinners, and sometimes, not even celebrated at all. It is just another Thursday in L’Hexagone. The past few years, Thanksgiving has unwittingly become an unofficial marker of my relationship, too, though my beau probably knows I think this only now that I write it. A couple years ago, we had only just started seeing each other, so new it was that when people at that Thanksgiving referred to him as my boyfriend, he gently corrected them (but since there’s no French word for dating, I’m not sure what term we were then. Just curious about the other, I guess). Last year, I was with my family, a rare occasion, and I was grateful to have the time with them. Just before the holiday, though, I got to experience that special bittersweet twinge unique to romantic partings. When I left Paris, it wasn’t just to return home for the long weekend, but to go to a long writing residency at the Kerouac House; my beau and I were saying goodbye for 3 months. I was moved to feel how greatly we’d both miss each other.